Jerry is a retired FBI Special Agent, and is a co-founder and past President of AHSCEF. While working in the Texas Governor’s Office, he helped write and implement the Texas Homeland Security Program. He is the owner of Gerald Adams & Associates, Inc., a private investigation/security corporation. He is past President of the Ronald Mc Donald House and the Society for Former Special Agents of the FBI. 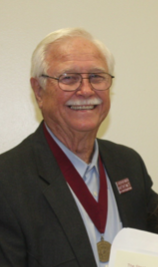 His wife, Gay Stolley, is a 1957 AHS graduate. Jerry is the recipient of the 2005 PEACE AWARD from the International Institute for Interfaith Dialog, Inc.